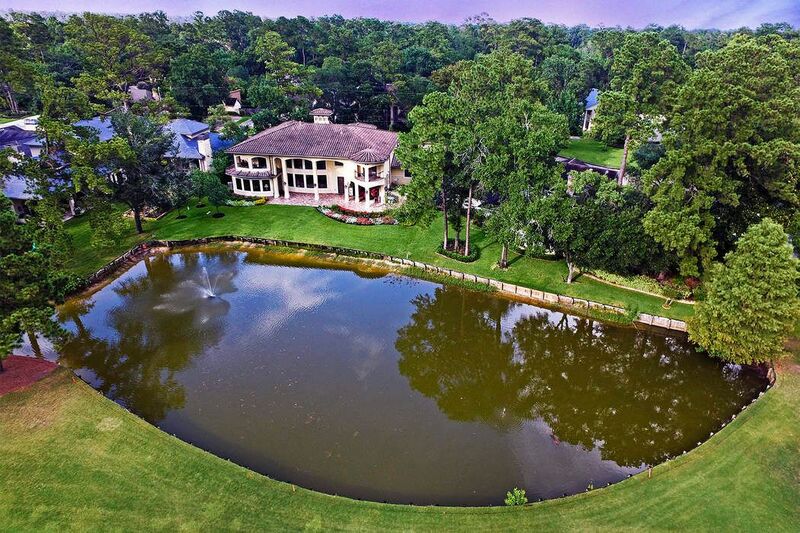 6238 Rolling Water Drive, Houston, TX 77069 | Martha Turner Sotheby's International Realty, Inc.
Mediterranean masterpiece on cul de sac with professionally landscaped grounds, irrigation system & circular drive. Front elevation has arched windows, tile roof, gas lamps, landscaped lighting. Garages include two bays for cars & golf cart garage. 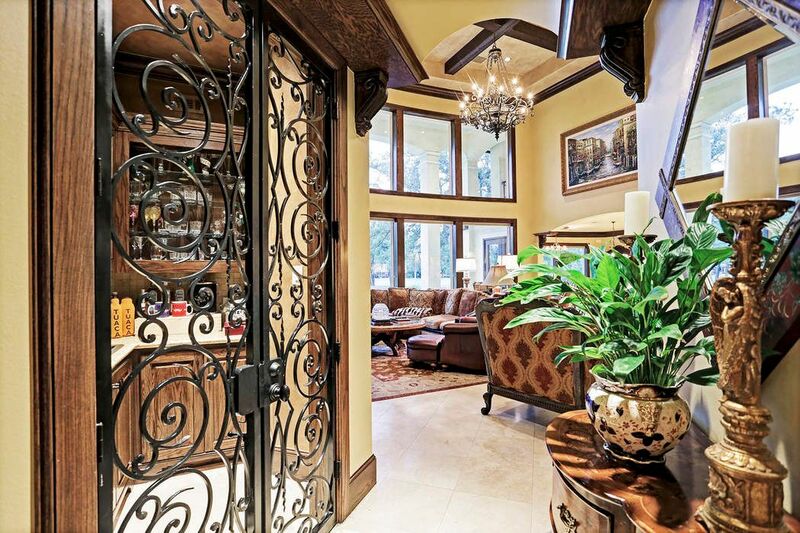 Foyer has 22 ceiling with custom 11 iron door with privacy glass & iron accents. Travertine flooring and wood semi-circle elevated landing entering study & staircase. Upper windows provide natural light. 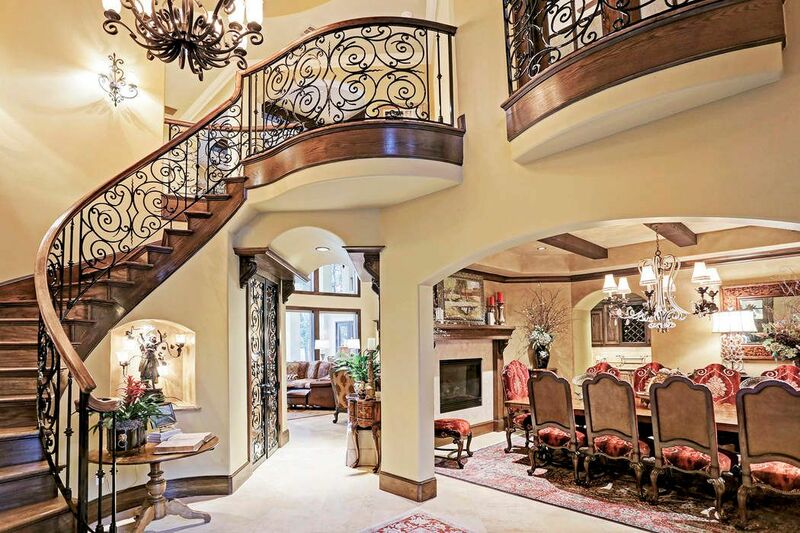 Just imagine welcoming your guests here. Tranquil view from back terrace is extraordinary. Just beyond the bulk-headed pond & fountain is the Champions Golf Club s Jack Rabbit Course, Hole #2. 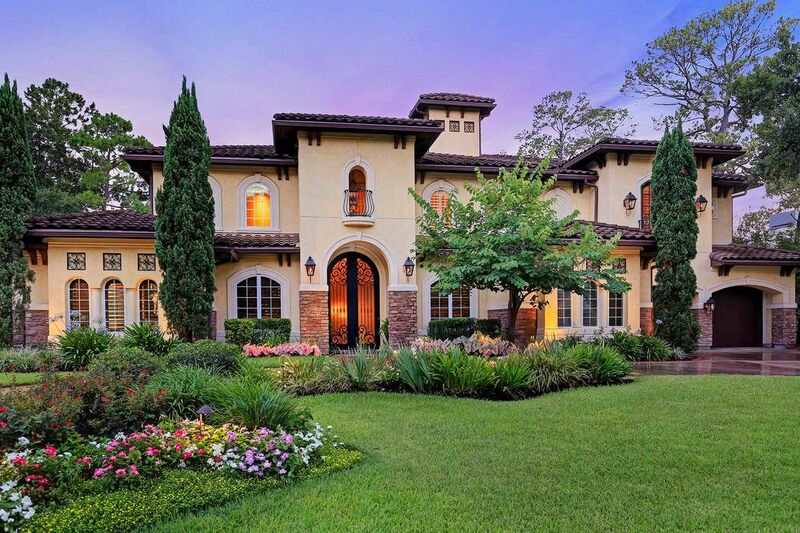 Exquisitely landscaped gardens provide color and depth. The irrigation system keeps it all green. Your view from the front door is magnificent! 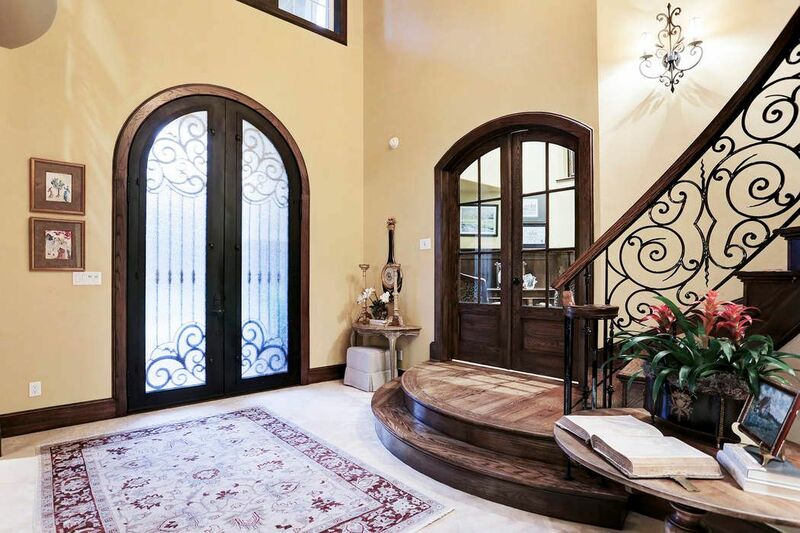 22 ceilings, wrought iron scroll work on stairway railing, wood treads, art niche under the stairway, barrel ceiling at wine grotto leading to great room & elegant dining room create an sublime entrance. Handsome dining room boasts beamed tray ceilings, speakers, gas log fireplace with travertine surround & wood mantle. Arched entrance to the butler s pantry for ease in serving. Elegant chandelier and arched window with plantation shutters. Butler s pantry has wine rack, custom wood cabinetry for storage and granite counter for buffet service. Accent tile insert illuminated by under cabinet lighting provides decorative flair. Arched doorway leads to great room and open kitchen. 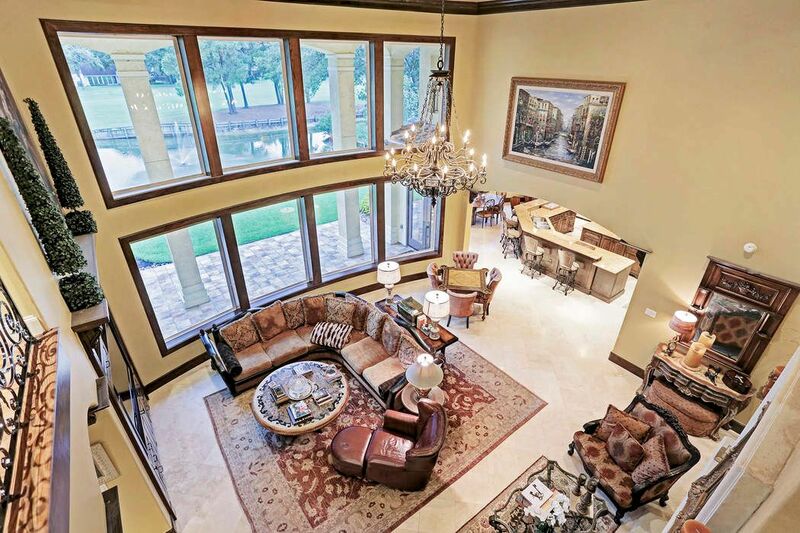 Great room has 22 ceilings, eight upper and lower windows overlooking pond and golf course. Travertine floors, cast stone fireplace with elevated art niche and cylindrical medallion. Stately wrought iron scroll work railings at the second floor. 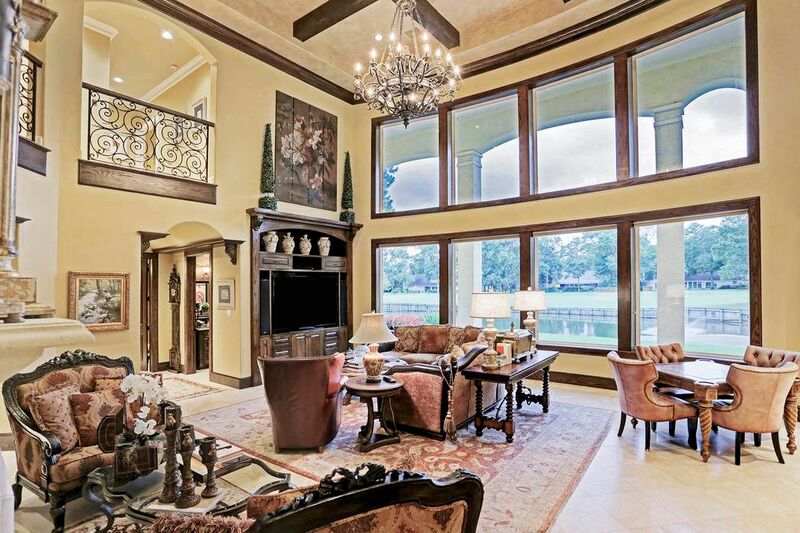 This vantage point of the great room showcases the pond and course view. 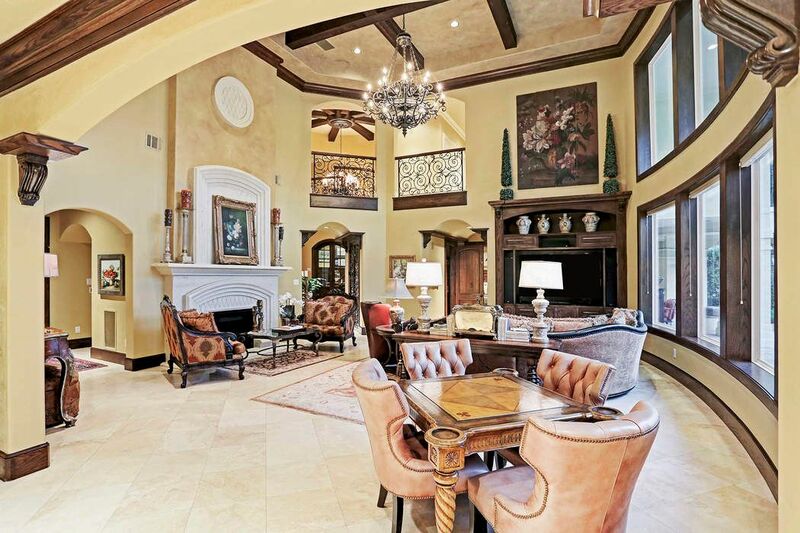 Elaborate chandelier has just the right scale for this spacious haven. Built-in wood entertainment center, speakers & beamed ceiling complete the ambiance. 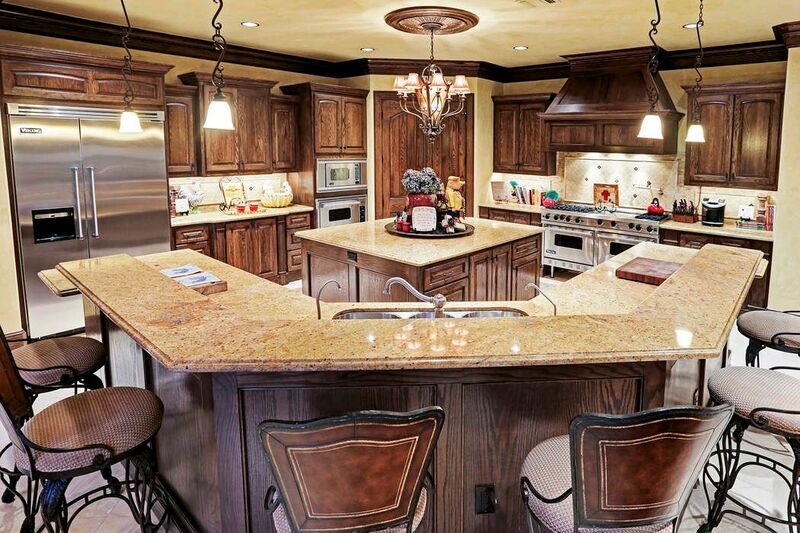 Epicurean kitchen has immense island & breakfast bar for seating 6. Viking professional series appliances include 60" range with two ovens, six burners & griddle, wall mounted oven, warming drawer & microwave, refrigerator & dishwasher. Large walk-in pantry for vast storage. Pot filler above range. Spacious breakfast room serves as a place to gather informally while enjoying the view. 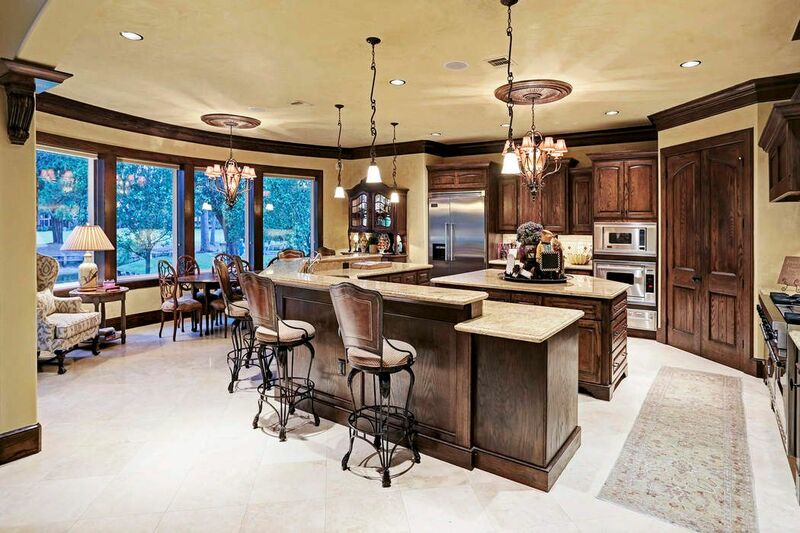 Two chandeliers, pendant lighting, under cabinet lighting & speakers set the tone for entertaining. 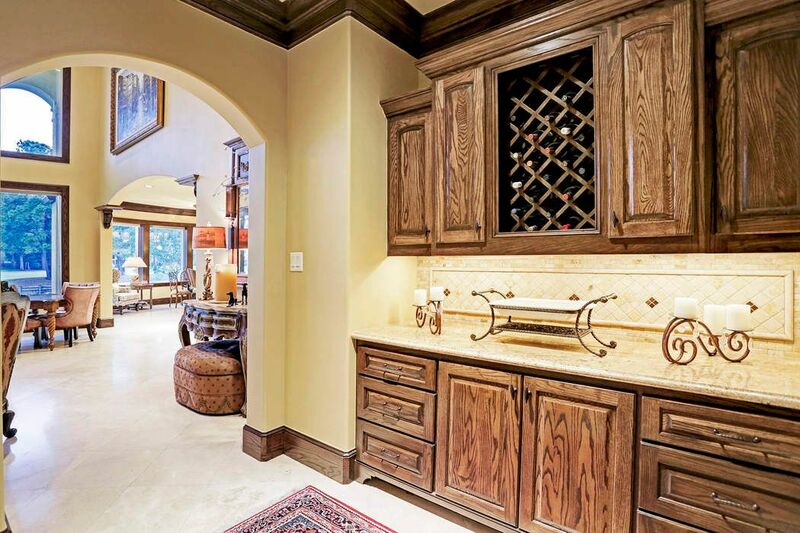 Wine grotto is just off the great room and includes wrought iron scroll work double door, wood cabinetry, granite counter, wet bar, wine refrigerator & custom humidor cabinet. This perspective of the great room shows the open concept floor plan. Floor to ceiling windows furnish an undeniably serene view. We couldn t resist adding this photo as it shows the spectacular attention to detail of this custom home. 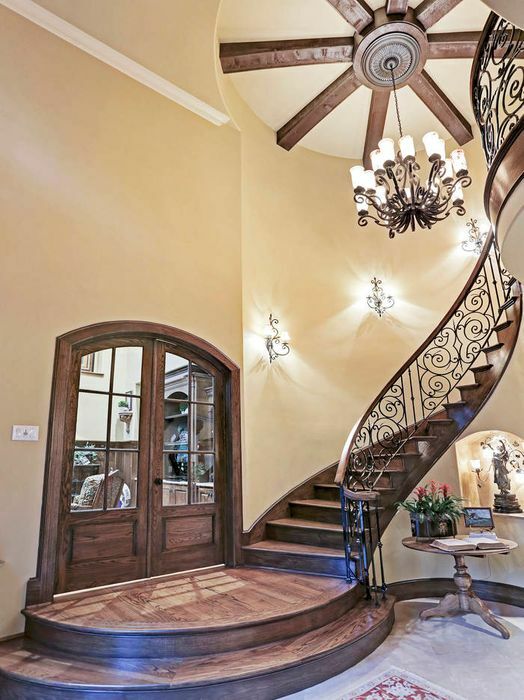 The stairway rotunda has a wood beamed cylindrical wheel that adds incredible character to the foyer. 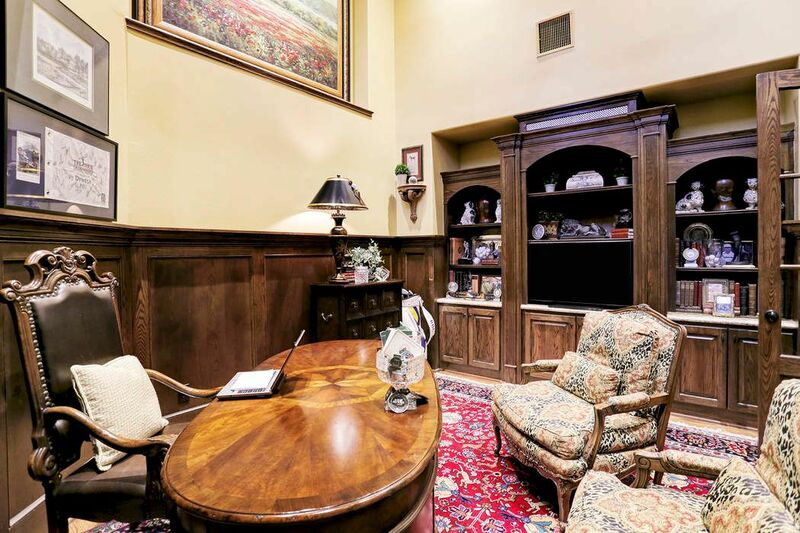 Study has arched double doors with glass panes, wood floors, custom built-ins for entertainment & storage, library paneled walls, built-in TV system, speakers, art niche, arched window with plantation shutters & elevated windows for natural light. 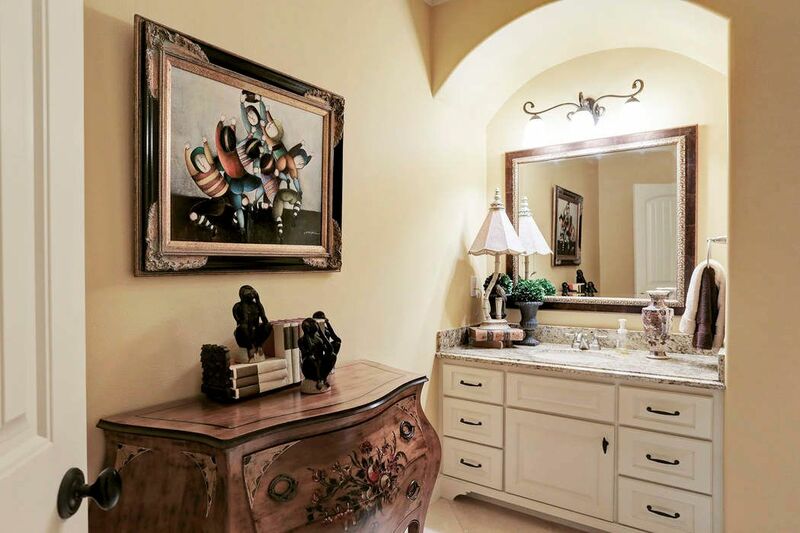 Powder room (one of two) boasts faux painted walls, wood vanity cabinet with granite counter, stone vessel sink & framed mirror. The door leads to the exterior to service both the inside and out. 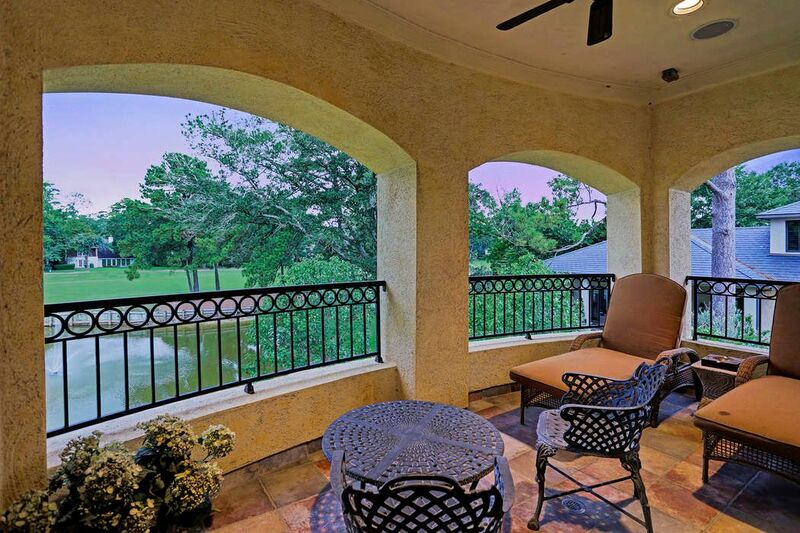 Master retreat has travertine floors, triple glass door access to private terrace, speakers, ceiling fan and arched doorway to en suite master bath. 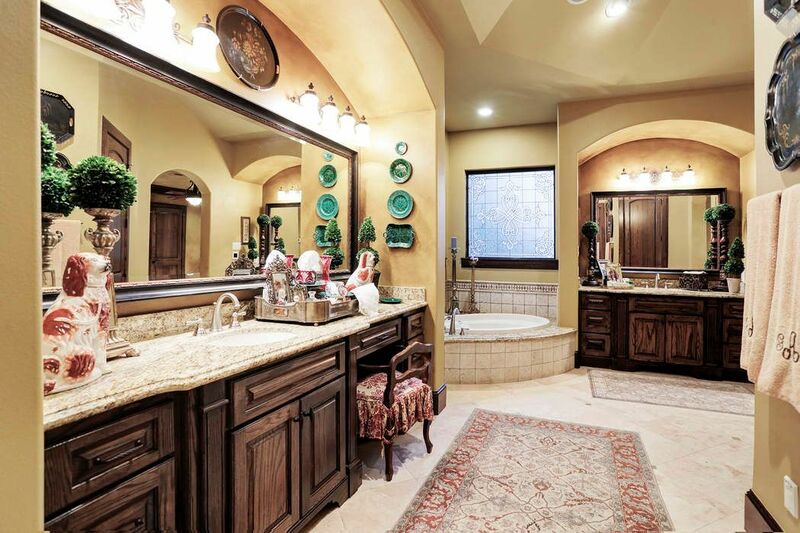 Master bath complete with double vanities under arches, with granite counters, framed mirrors and a seated vanity. Soaking tub has decorative privacy glass and spacious shower has rain head and body spray heads. True indulgence! 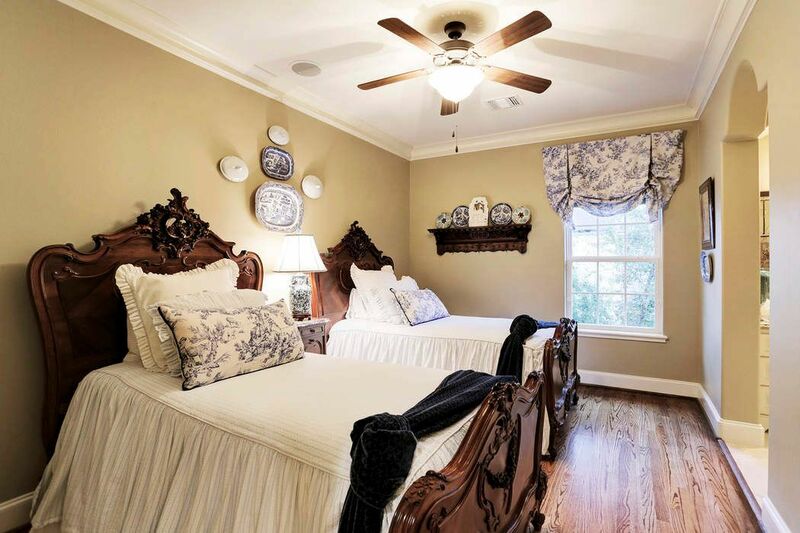 Master suite private terrace has Saltillo tile flooring, fire pit under a rotunda, speakers, ceiling fans, built-in entertainment center with custom tile work & storage with tower fans. 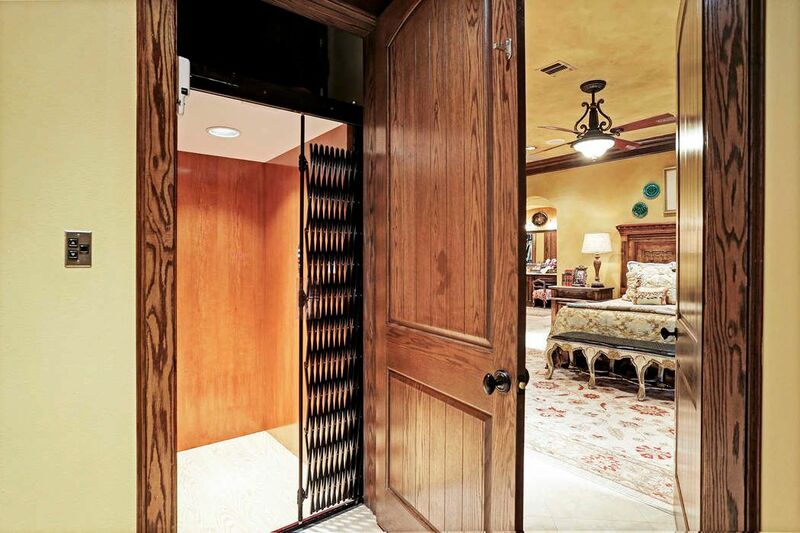 Elevator provides ease for those who cannot take the stairs and is beneficial for moving heavy items to the second floor. Other features include smart home audio & security, central vacuum, reverse osmosis water softener, four zoned A/C units & more. Guest suite has wood floors, ceiling fan, speakers, large walk-in closet, en suite bath with tumbled travertine shower and granite counters. But wait . . . it even has it s own private terrace overlooking the back yard. Guest suite private terrace with ceiling fan, Saltillo tile flooring and speakers. Look at that view! Your guest may never want to leave. This suite is ADA accessible. Across the hall from the elevator & through a widened door, this suite has a sitting room & access to a private terrace. 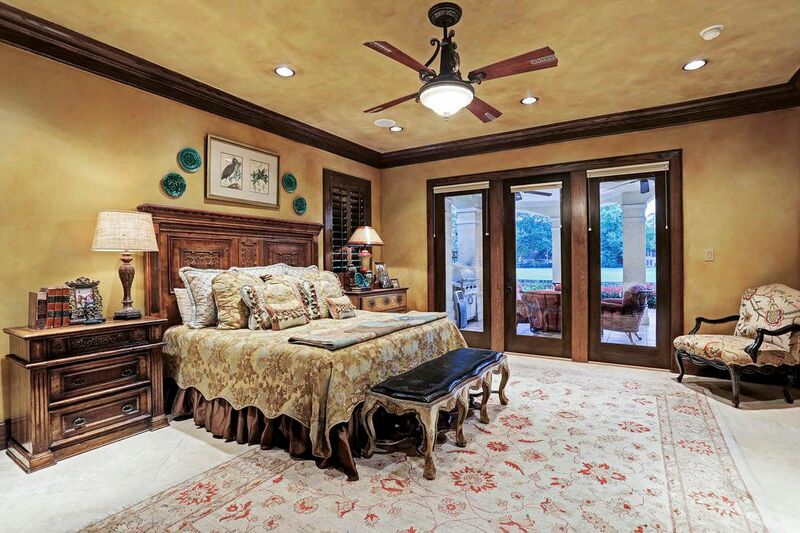 The arched open doorway leads into the sleeping quarters with tray ceiling, speakers & ceiling fan. ADA accessible en suite bath has widened door, roll-in shower with dual heads and seat. Lowered vanity (not shown) provides easy access to sink. Spacious closet completes the retreat. What a very special amenity to have in this impressive home. 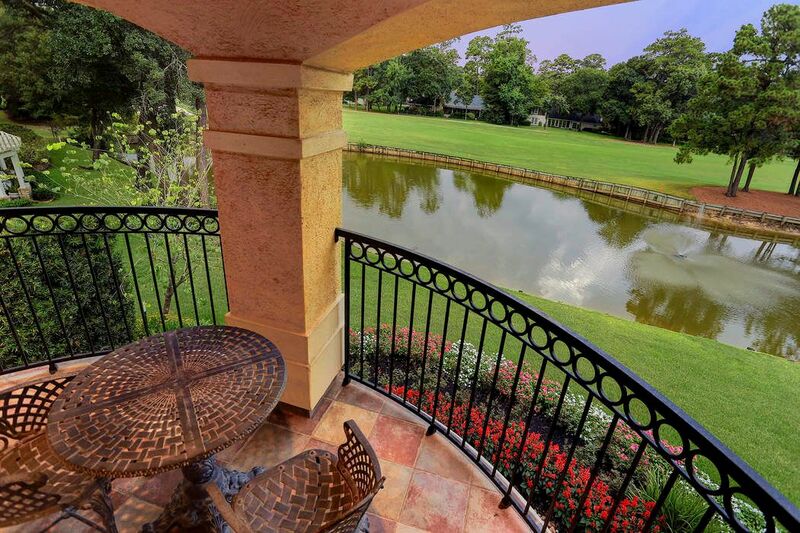 Private terrace off the ADA accessible room has a splendid view of the pond and golf course. Another upstairs bedroom has hardwood floors, speakers, ceiling fan and access to Hollywood bath. Hollywood bath has granite counters, white cabinetry and travertine floors. 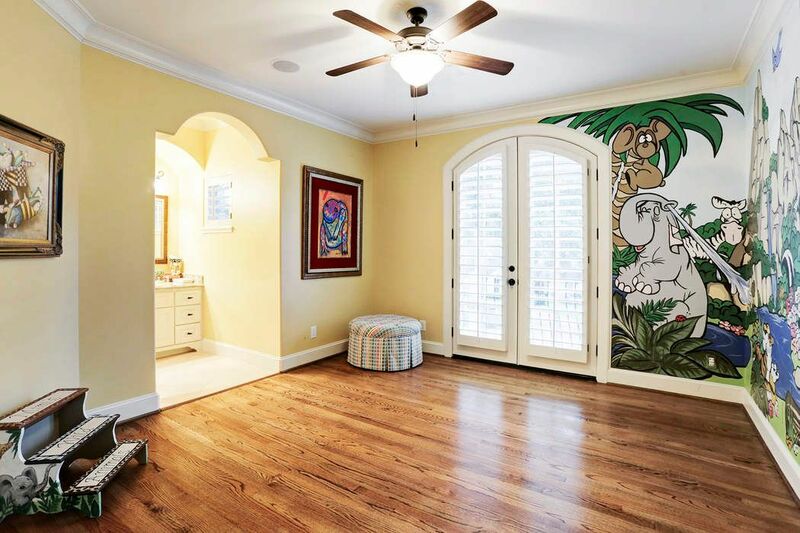 Another upstairs room has access to the Hollywood bath, wood floors, ceiling fan, arched double doors to a juliet balcony and a custom hand painted mural for children. 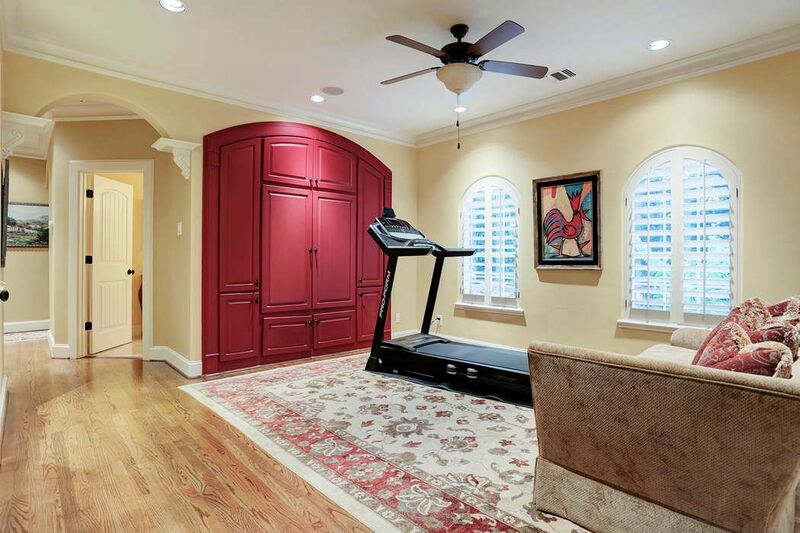 Game room with built-in entertainment center & storage has hardwood floors, ceiling fan, speakers, two arched windows with plantation shutters and access to the second powder room. 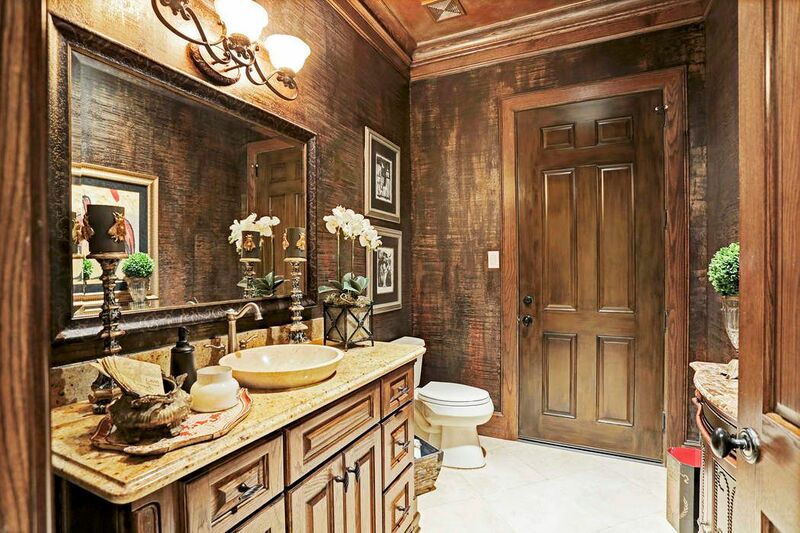 Upstairs (second) powder room has vanity under arch, granite counter, under-mount sink, white cabinetry and travertine flooring. This peaceful pond with fountain serves as the foreground for the Champions Golf Club s Hole #2 of the Jack Rabbit Course. There is a reason they call it a "green." Complete with irrigation and mosquito systems, you can truly enjoy the outdoors! This vantage point shows the back of this executive home located in Champions South. 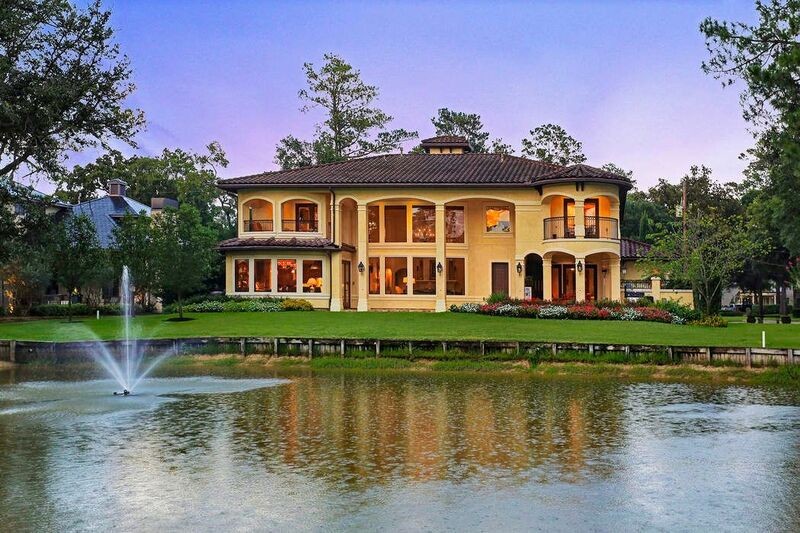 Stunning architecture exudes warmth and sophistication. 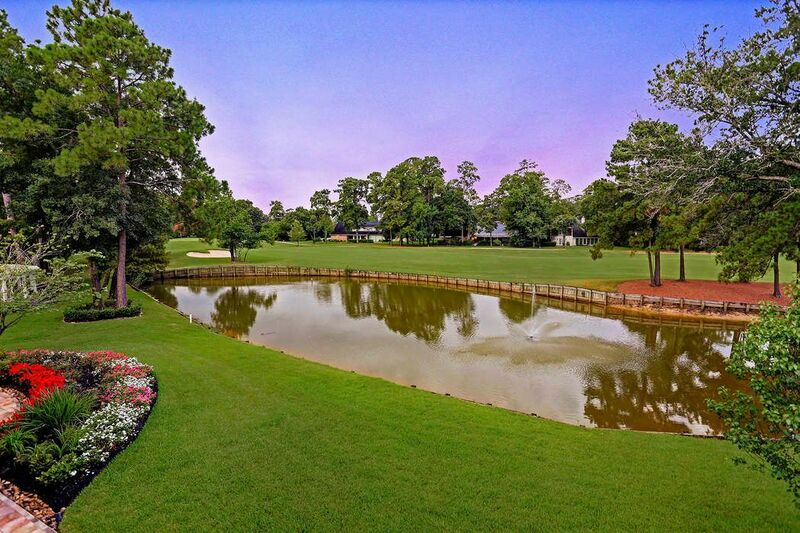 Lush surroundings, stately home, stellar views, custom features, easy access to 1960 & 249. Your new home awaits. Call today for a private showing. $998,000 5 Bedrooms4 Full / 2 Partial Baths5,979 sq. ft. 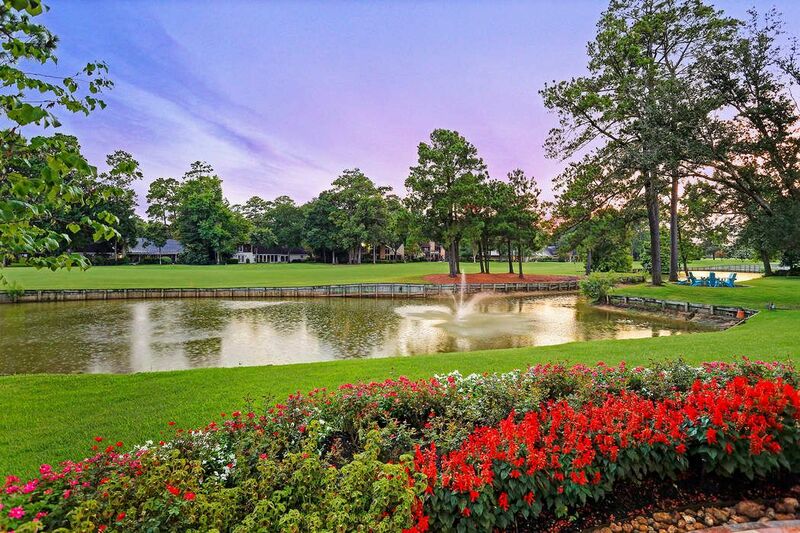 Elegant Mediterranean-style masterpiece positioned on Hole Two of Champions Jack Rabbit Golf Course with breathtaking views of a bulk-headed pond with fountain and lush greens beyond. Built with attention to detail, this executive residence includes a master suite down and spa-like bath with soaking tub and large walk-in shower with rain head and body spray. 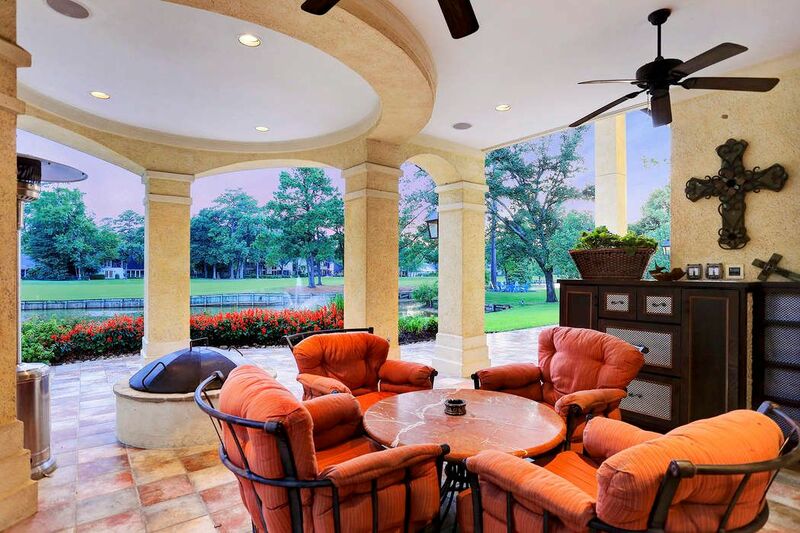 Through the double glass doors, you will find a private patio with fire pit under a rotunda and built-in entertainment center. Great room has stellar views through a wall of upper and lower windows, cast-stone fireplace, built-in media center, beamed ceilings and ornate chandelier. The epicurean kitchen boasts Viking professional series appliances including 60-inch gas range with two ovens, six burners and griddle. Another oven is wall mounted along with a warming drawer and microwave. Other Viking appliances include refrigerator and dishwasher. The morning room provides a place to take in the views. 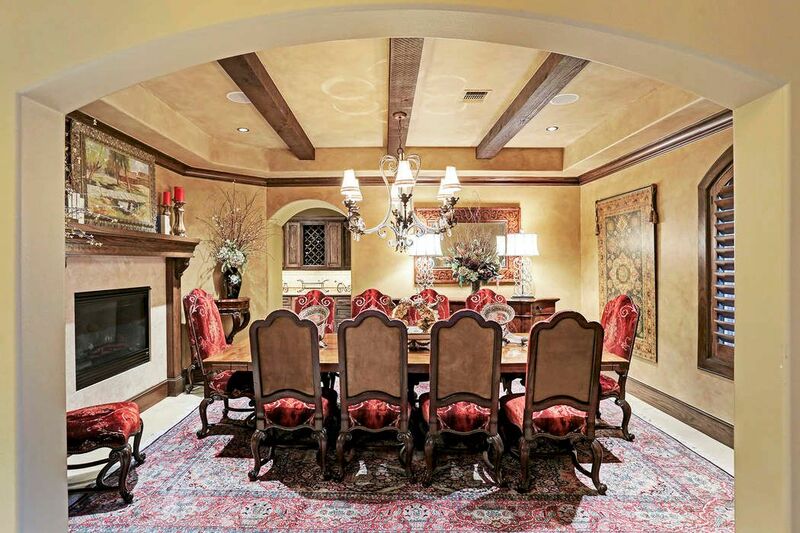 Gracious dining room with beamed tray ceiling has fireplace and travertine tile flooring. Other amenities on the first floor include a wine grotto, powder room (one of two), elevator and a study with wood library panels, wood accented tray ceiling, and plantation shutters. Upstairs boasts a handicapped accessible retreat with sitting room, private terrace, built-in book cases and roll-in shower with wide doors and lowered vanity. 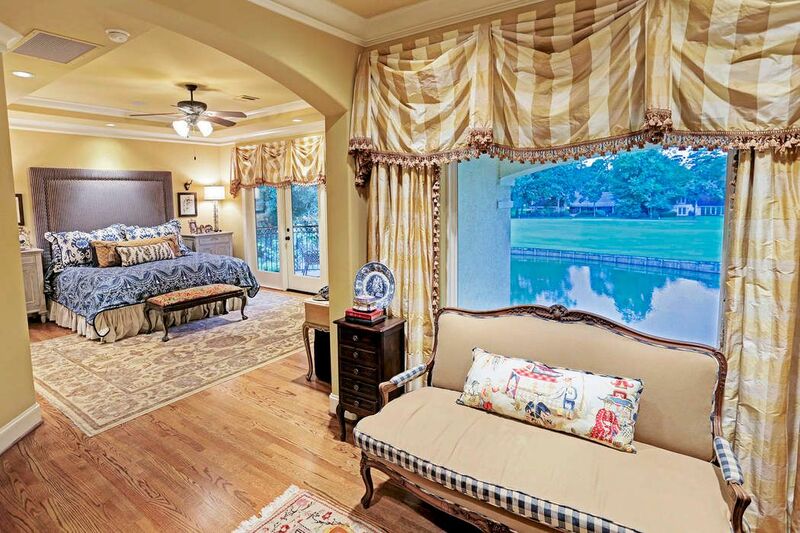 Another bedroom has an en suite bath and private terrace overlooking pond and golf greens. Two additional bedrooms share a Hollywood bath. 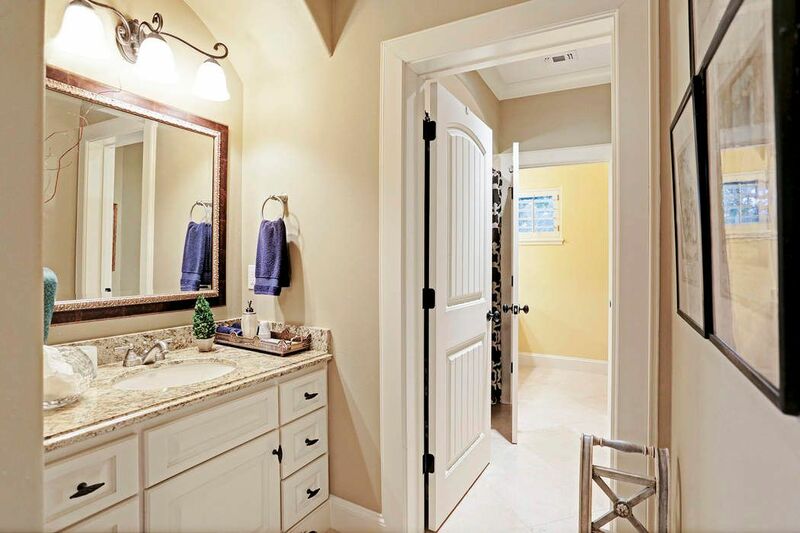 In addition, you will find a game room with built-in entertainment center and second powder room. Some of the mechanicals include smart audio system, central vacuum, reverse osmosis water softener, mosquito system, speakers throughout and 4 zoned air conditioning units. For energy efficiency there is radiant barrier in the attic and two tankless hot water heaters.